If you want to add a significant amount of custom CSS, the best method is to use a custom stylesheet. This will load the custom/custom.css file after the ShiftNav core files, but before the Custom Tweaks from the settings. In the plugins/shiftnav-pro/custom directory, create a custom.css file (you can rename custom-sample.css). 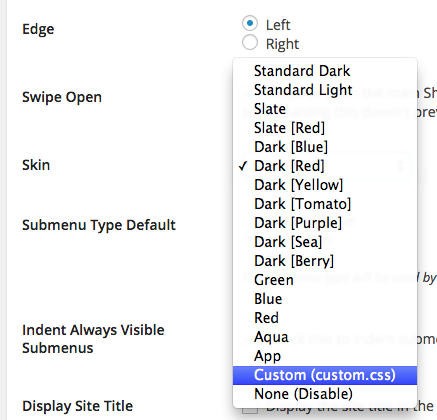 It’s easiest to begin by using the contents of the custom-sample.css skin and changing or adding styles as you like. If you are familiar with LESS, you can use the custom-pro-sample.less file to generate your custom skin.